Exclusively on vinyl from Greenway Records. Recorded live at last year’s McCabes show. Bob set to perform at Hardly Strictly Bluegrass 2016! Bob will be performing at the 2016 installment of the Hardly Strictly Bluegrass festival at Golden Gate Park in San Francisco. Click through to the festival site for more information. Bob will play Friday September 30th, 12:45pm on the bandwagon stage. Bob is set to make a return to the famous McCabes stage after nearly 20 years. September 24th, 2016 at 8pm, with some very special guests. The Bicycle Thief and The Haden Triplets (with Anna Waronker of That Dog fame and Cleto Escobedo from Jimmy Kimmel live) cover David Bowie’s Changes for The Movember Foundation and WholeWorldBand #‎MoChanges You too can contribute to the song via the WholeWorldBand app, Versions with Stewart Copeland (The Police), Graham Gouldman (10cc), and Richard Barbieri (Japan, Porcupine Tree) are also available with more to come throughout November. “Movember & WholeWorldBand present MoChanges! Be part of the MoChanges music video and help Change the face of men’s health. This is about a music session that began in The Boat LA studio, owned by Flea from the Red Hot Chili Peppers, that is now opened up for the whole world to take part in. It’s based around the legendary song ‘Changes’ by David Bowie because we believe that change is possible for men’s health and that music can be a key part of this. This original recording session features a host of famous faces including Bob Forrest & Josh Klinghoffer (Bicycle Thief), Rachel Haden, Petra Haden & Anna Waronker (That Dog, Beck, Foo Fighters) and Cleto Escobedo (Jimmy Kimmel live). Joining them in the WholeWorldBand online studio are a number of iconic artists including Stewart Copeland (The Police), Graham Gouldman (10cc), and Richard Barbieri (Japan, Porcupine Tree) with many more to be announced, creating one of the world’s biggest supergroups. Movember are inviting everyone to be a part of the MoChanges global music video – all you have to do is download the WholeWorldBand app and press Record. The app will automatically add you to the Changes video along with the other stars. You can sing along with the lead vocal, add guitar or drums, sing the chorus – “Ch-Ch-changes” – or just dance around. You can make your own personal Movember video and share it on Facebook, YouTube, and Twitter. So join in, have fun, and help change the face of men’s health while you’re doing it. 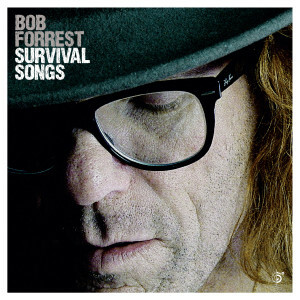 Survival Songs – Available Now! Six Degrees Records has released Bob’s first solo album in nearly a decade, available now on CD/Digital and on Vinyl this Friday (10/16). Order Survival Songs Directly From The Label Here. Bob’s latest solo album (his first in nearly 10 years!) will be in released October 9th. See more on the label website here: and click through to the tour dates section, Bob will be in a few major cities across the US. The second entry in a series of interviews looking at the other folks involved in making the records you associate with Bob Forrest. An in-depth conversation with Zander Schloss, Occasional Thelonious Monster guitarist, Circle Jerks Bassist, Joe Strummer Sideman and co-captain of Sean & Zander. Click on the banner for more. After you’ve finished reading the interview, like the Sean & Zander Facebook page and follow them on Twitter. Then, shoot us an email (bobforrestmusic@gmail.com) with your user names so we can verify and we’ll enter you for a chance to win a signed copy of the brand new Sean & Zander album, Other Desert Cities. It’s a good one. As this year marks the 15th anniversary of The Bicycle Thief, we’re making our compilation, “RARE” that was recently released as a limited edition physical package at Save Music In Chinatown, available digitally to the general public. You can order a copy in our store. Lossless Flac/320 mp3 & artwork PDF. $10. The Bicycle Thief To Reunite For Save Music In Chinatown. 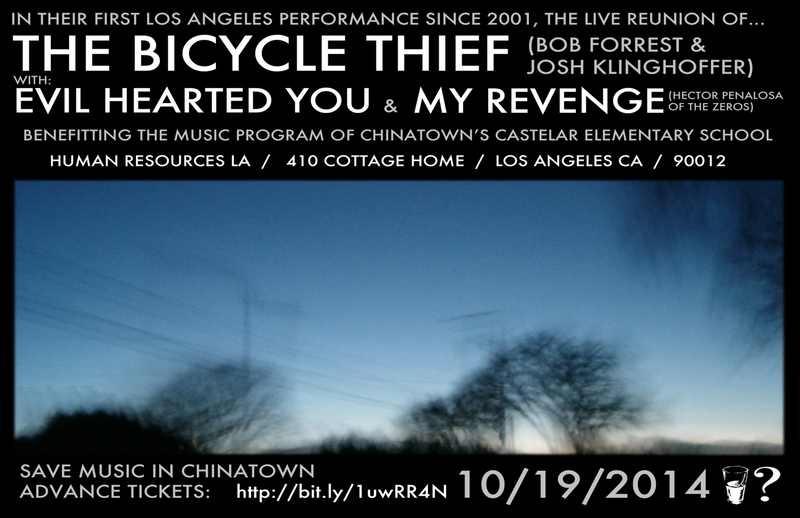 Yes, you’ve read that correct, Bob Forrest & Josh Klinghoffer will reunite as The Bicycle Thief for their first public performance in many years. 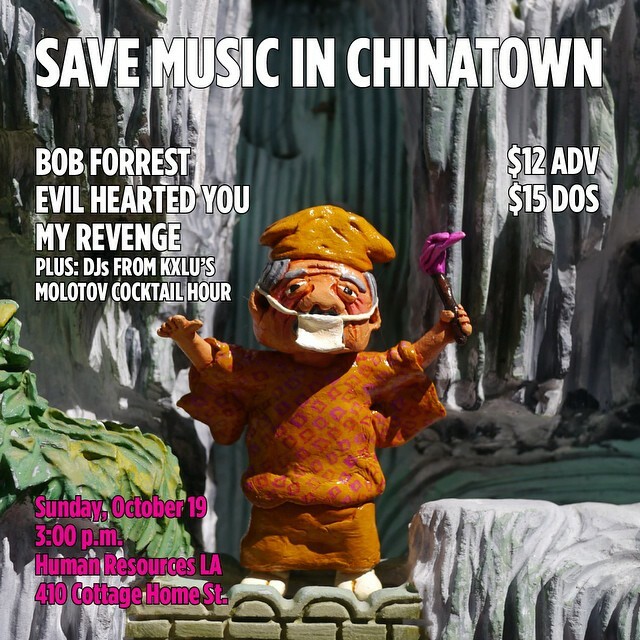 Save Music In Chinatown will occur on Sunday, October 19th at Human Resources LA, in the Chinatown neighborhood of Los Angeles. Evil Hearted You and My Revenge (feat. Hector Penalosa from original L.A. punk band, The Zeros) will perform as well.